Bill Nye has been the public face of science for more than 20 years. In Everything All at Once, the New York Times bestselling author urges readers to become activists and agents of change. Everything All at Once is an exciting, inspiring call to unleash the power of the nerd mindset that exists within us all. Nye believes we'll never be able to tackle our society's biggest, most complex problems if we don't even know how to solve the small ones. Step by step, he shows his readers the key tools behind his everything-all-at-once approach: radical curiosity, a deep desire for a better future, and a willingness to take the actions needed to make it a reality. Problem solving is a skill that anyone can harness to create change, and Bill Nye is here to teach us how. Each chapter describes a principle of problem solving that Nye himself uses-methodical, fact-based approaches to life that aspires to leave no stone unturned. He explains how the nerd mindset leads to a richer and more meaningful life; far more than that, it can help address hunger, crime, poverty, pollution, and even assist the democratic process. 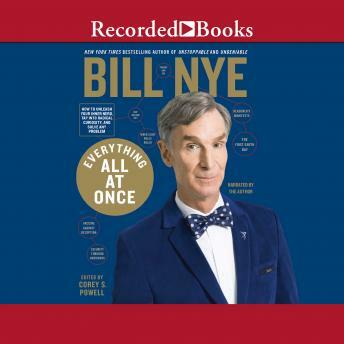 Throughout the book, Nye draws on his own experiences-leavened with his trademark humor and self-deprecation-to show how he came to think like a Science Guy, and how you can, too. By the end you will be ready to sort out problems, recognize solutions, and join him in.changing the world.